When people are considering buying a new home, they will more often than not get a building inspection done prior to signing a contract. But this doesn’t take into account an inspection of the current electrical set up of the home. Many homes on the North Shore are at least 50 years old and most of them may not have been rewired and still have their old electrical systems in place. Before you sign the dotted line of a contract, along with your building inspection, it is a very good idea to have a licensed electrician visit to do an electrical inspection to confirm the electrical safety of the house is up to scratch before you move your family in. 1. To check the wiring in the home is up to scratch. The electrical wiring in a home is often out of sight so you have no idea the condition it is in. Electrical safety is so important with faulty wiring being the main cause of household injuries and electrical fires. Having a qualified electrician inspect the wiring of a home is just as important as a building inspector checking the building is safe and in good working order. 2. To check smoke alarms are adequate. It’s a fact that 50% of household fatalities could have been prevented if a working smoke alarm had been present. If a smoke alarm was installed more than ten years ago, the chances are it needs to be updated. Having a good quality smoke alarm is critical to the safety of anyone living in the home so it’s essential to have it checked out prior to moving in. 3. Check circuits are not overloaded. Overloading occurs when too many devices are wired into one electrical power point, resulting in that “route” becoming overloaded. It can affect the electrical system by causing breakers to pop and, left long enough, the breaker associated with the power point will eventually blow. It is much more efficient and cost-effective to identify and fix any overloading issues early on at the time of purchasing the home. 4. Ensure electrical systems in the home meets Australian standards. When you are thinking of buying a new home, you simply don’t know who has done electrical repairs in the past and the quality of workmanship involved. There’s a possibility that some of the work wasn’t completed safely or up to code, particularly if it was undertaken by an unqualified electrician. Our team can conduct an inspection of all connections to ensure they are up to scratch and pose no electrical risks to you and your family. 5. Ensure your electrical devices and fittings are right for you. Many homes are not set up to be energy efficient. Or perhaps the light fittings are not to your taste. Before you move in, it may be a good idea to make changes to ensure the new home meets the needs of your family. Do the bedrooms have ceiling fans? Are the bedrooms and living areas fitted out with energy efficient LED downlights? Do the bathrooms have exhaust fans? Is there adequate heating and cooling systems in place? If you have a licensed electrician coming to inspect the electrical safety of your home, it’s a good time to get some advise and a quote on doing these upgrades for when you move in. It’s always a good idea to have any new fittings done prior to painting ceilings and walls or laying new carpet. 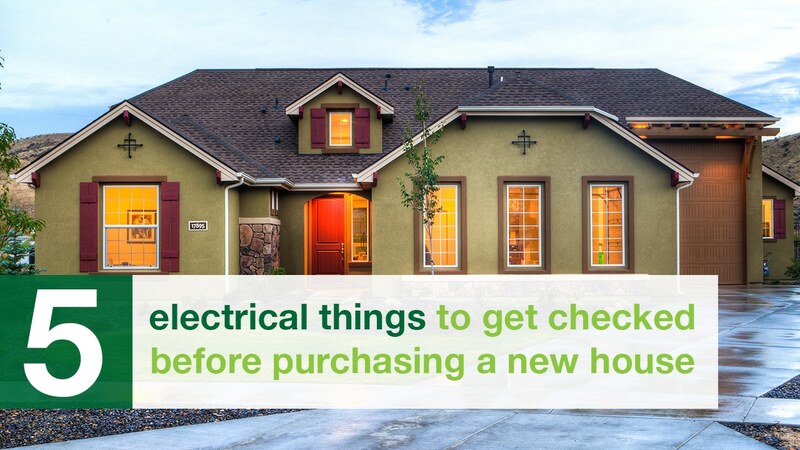 The electrical system of a house should never be overlooked when buying a new home. It is, after all, possibly the most dangerous part of the home’s construction. By having your system checked by a professional prior to purchasing, you’ll get the peace of mind that your family’s safety has been addressed and that you won’t have any nasty surprises like major repairs to the system in the near future.